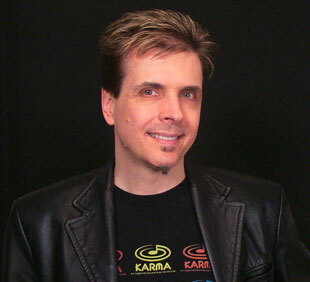 Karma Lab president Stephen Kay has an extensive background as a professional musician and composer. He started singing and playing the piano at age seven and was classically trained as a child. 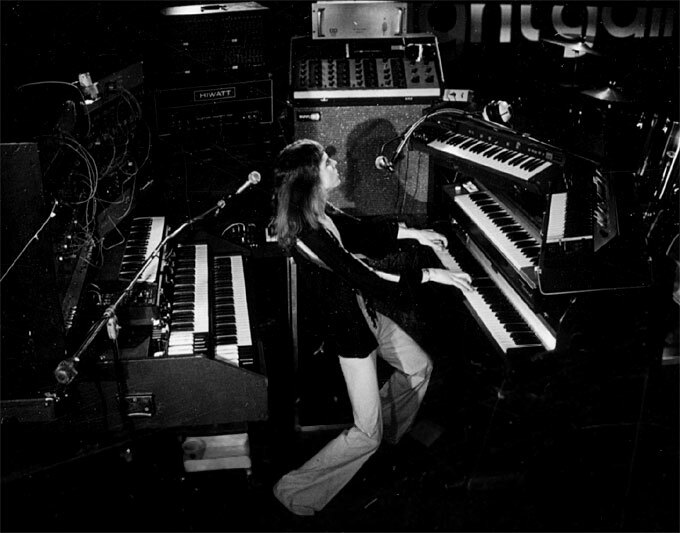 Since then he has played in just about every musical situation you can think of, including rock bands, show bands, jazz fusion bands, piano bars, recording studios and cruise ships. His compositions and recordings have appeared as themes for world-wide NBC sports programs such as Wimbledon and the French Open. He has sampled and edited the waveforms of symphony orchestras for a collection of sounds for the Fairlight Series III; he has traveled extensively world-wide as a product demonstrator for KORG. He is perhaps well-known (to a few at least) for having created some of the wackiest and well-received factory demo sequences in the Musical Instrument Industry, often using algorithmic computer generated musical effects. Among the many products which shipped world-wide with his sequences installed are the KORG M3, Karma, Trinity, 01/W, i-Series, X5DR, 03R/W, and the Alesis QuadraSynth (v2). These sequences, which have convinced tens of thousands of people around the world to lay out their hard-earned cash for various keyboards and sound modules, can be listened to from the Product Demos section of Kay's Media Gallery. Kay is also a noted sound developer, having provided sound programming, sampling and waveform editing services for many Korg products including the Kronos, M3, OASYS, Karma, Trinity, 01/W, i-Series, X5DR, and 03R/W, not to mention Karma-Lab's own KARMA-fied sound sets. After receiving two U.S. and Japanese patents for features on the Korg i-Series that he developed in Opcode’s Max (now a Cycling '74 program), Kay was seduced by the evil lure of computer programming and has since become a proficient C/C++ programmer. Not to mention HTML, PHP, Flash, and others. He now has no life. Since 1994 he has been developing the algorithmic music technology named KARMA®, which stands for “Kay Algorithmic Realtime Music Architecture”. 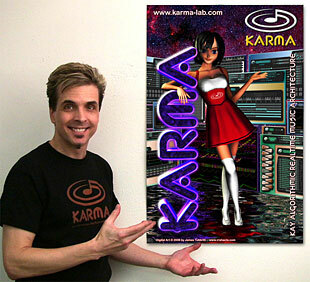 Over the past several years, KARMA has been awarded 9 US Patents. Several products incorporating the technology have been released, with more on the way. The award-winning Karma Music Workstation was released to critical acclaim in 2001, Korg's flagship synth OASYS was released in 2005 and was the world's most impressive and expandable workstation at the time, and the Korg M3 Workstation was released in 2007 and rapidly became the "workstation of choice". In 2011, Korg's new flagship synth KRONOS was released and has become the workstation of the decade. The newer products incorporate an even more advanced version of KARMA Technology. Kay has also released standalone PC/Mac software versions of KARMA for several products that do not incorporate the technology internally, notably the Korg Triton series and the Korg M50. Most recently, in January 2011 Kay announced a new partnership with Yamaha, to release “KARMA Motif” Software for their flagship Motif XF and XS series of keyboards. The software was released in 2012. The latest version 3.2 supports six different Yamaha keyboards, including the Motif XF, Motif XS, MOX, MOXF, S70/S90 XS and Motif Rack-XS. Also in January 2011, Kay produced and released an original tribute video/song for the 25th Anniversary of the Challenger Space Shuttle disaster, using the Korg KRONOS, that was featured on the official Challenger.org site and many others. More info about the story behind the song, the mission, the recording and production and more can be found at his ChallengerTributeSong.com site. Jan-2005: KARMA Developer Stephen Kay is featured in the new book "The Art Of Digital Music", which offers interviews with 56 "visionaries and insiders."